Today I am going to game another BBC scenario: I am looking into how the BBC might become an encrypted service, but without turning the BBC into BBC plc. In my almost all of my previous writings in this BBC 2017 section, I have been looking at either keeping the BBC as it is, or turning it into BBC plc in a near-future without public service broadcasters. Another possibility is that the BBC keeps the status of being a public service broadcaster. One of the problems for the BBC plc option is that the BBC would be required to pay the going-rate for the encryption (which would be £62 a year). This would mean that the BBC could collect the current level of income by a monthly charge of £14, if the BBC fee was made opt-out. Non-payment of the BBC component of the bill would block BBC services. If the payment was opt-in, this might require the fee to be raised to £18 to get 60% of homes on board. However, there is an "elephant in the room" in this plan. Which are the 10.3 million homes that use Freeview alone. 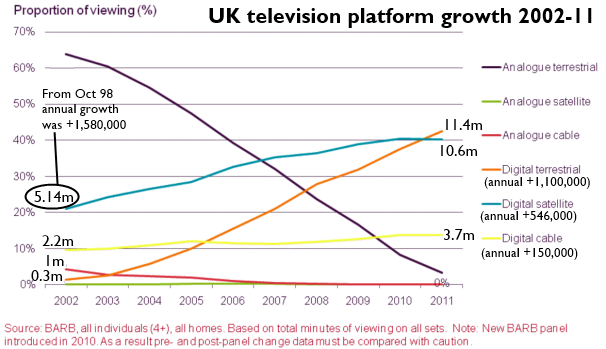 The following is an Ofcom diagram showing the take-up of the digital TV platforms in the 2002-2011 period. The staggering growth of Freeview, which added 1.1 million homes a year, and the initial launch of Sky Digital which managed 1.6 million homes per year were both quite an achievement. However, you then have to ask how long, using these adoption rates, it would take to convert 10.3 million homes to have pay-DTT. This diagram gives the answers. Who is going to want to buy a BBC subscription box ahead of the time that it can be used? There is no consumer benefit. 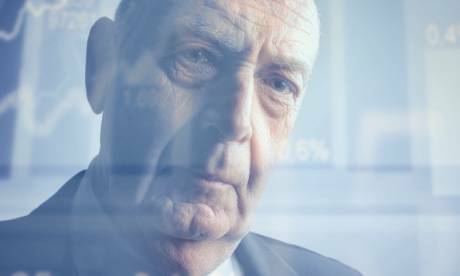 If the BBC is not transformed into a cash-rich public company, how can it fund the boxes? With no prediction of future profit, who would invest in "Beebview", especially given the scale of the project? Given the "postcode lottery" of DTT reception, a package that also included subscription would be beneficial to those with eight multiplex coverage, and useless to homes with Freeview Light's three multiplexes. Long term internet television boxes could provide an answer, but they still unlikely to see an adoption fast enough. It seems that even a legislated solution to ensure that Sky and Virgin do not profit from the BBC would still require the biggest-ever technology roll out to encrypt the BBC services on DTT. It seems that keeping a the vocal minority of 3% who do not wish to contribute happy, would cost everyone else (including Sky and Virgin) "big bucks". I can see the BBC evolving into a fully commercial set up at the end of the day just like the other 95% of stations have done, it's the old saying, if you cant beat them, join them. Todays competitiveness means that too few people would be willing to want to pay the £150 odd subscription fee, thus forcing the BBC to make dramatic cutbacks to the point of not being able to compete with ITV and the like. Another important point ... Radio encryption of BBC radio stations would be simply impossible to implement and i doubt very much the Beeb would approach this problem by simply shutting all stations down just to save a few bucks. The BBC is now proposing that everyone should be forced to pay the licence fee regardless if they use the service or not. Absolutly outrageous. The BBC is so out of touch with public feeling. A poll in the telegraph is showing 86% are against this. No one seems to have any control over this organisation. They just spend spend our money with no regard to the licence payer. The latest is the sending of hundreds of people on a jolly to the World Cup.They have been hauled before the parlimentrary finance committe on numerous occasions but still they refuse to reform. Another thing to consider is that Freeview and Freesat have enabled a lot of imported and homebrew (often computer-based) devices which at best can take a Common Interface encryption module and often cannot. Many owners of these devices will work on cracking the BBC encryption as a first option (despite what the law says) and probably ignore it as a second option, like they did with ITV/4/5 when they were still encrypted. Some owners of those (including me) don't want to trade with the Murdoch empire and would probably ignore all BBC channels in preference. There'd still be a lot of European channels receivable easily with a dish here, after all. Alvin Pritchard: Since Brianist has spent considerable timepointing out that the even if the BBC was to capture the whole of ITV's advertising revenue, thats £1.6 billion would just cover BBC1 with a little bit left over, and the subscription idea has a huge number of practical and economic problems, how exactly is this ' fully commercial set up' supposed to work? Frankly, for £150 a year, I get a hell of a lot more value from the BBC than I do from Sky, who want me to be tied into their hardware, and for £21.50 a month apparently wish to supply me with the doubtful delights of E!, Alibi, Sky Living (no kids channels, I notice). Yes, there's Sky 1, Atlantic/Arts and Sky Living, but overall, for for the money, there is a lot of filler, and a lot of repeats. Even at 20p a day, the licence fee looks better value than Sky's basic at 28p per day. And Sky still make me watch adverts. So much for that 'competitiveness', especially since BBC 1 on a Sat. night can get something like a 40% share. trevorjharris: As Stephen Colbert put it, 'facts have a liberal bias'. Brianist has already pointed out that 98.2% audience reach is achieved by BBC1 in a week - so basically, if you have a TV, pretty much everyone watches BBC1. Even if you dont, your probably watching something else on the BBC, using the website or listening to the radio. As you admitted last year, you might not watch the BBC, but your wife apparently likes Strictly, The Paradise and Call the Midwife. Everyone pays, and everyone gets something back. If the 'poll' you refered to was this BBC wants you to pay TV licence fee even if you don’t own a set, as shows go on iPlayer for longer - Telegraph - then I'm not surprised at the result. Apart from the tone of the article being somewhat biased(! ), the title of the survey was hardly subtle 'Would it be fair to pay the licence fee even if you do not own a television?' If the question had been 'should people pay the licence fee if they use Iplayer? ', then the polling would have been a little different. And since one of the three answers is 'No - this would be exploitative', you could see where the Telegraph was going with this. Frankly, I dont think the BBC is out of touch, rather an ideologically driven astrotruf campaign has a somewhat loud voice. Most viewers couldn't really care less. BTW - how many Sky personnel are going to Brazil, and will this also be a 'jolly'? As a matter of interest the BBC already uses encryption for the freeview epg. As far as I know Sky's encryption has never been cracked and also cards are changed every few years. All encryption system are crackable it is just a question of how much it costs to crack. A good encryption system will be uneconomic to break. If you investigate I think you will find that the Murdoch family has no financial interest in Sky UK. News International does not even exist. Murdoch is more interested in Newspapers rather than TV. The BBC may be getting a 98.2% reach but it is quite clear that the BBC would not get anything like that if they had a choice of not paying the licence fee. That is what the BBC is so keen to keep the licence fee enforced under threat of prision and a criminal record. If Sky were overcharging for thier service people would not pay for it. 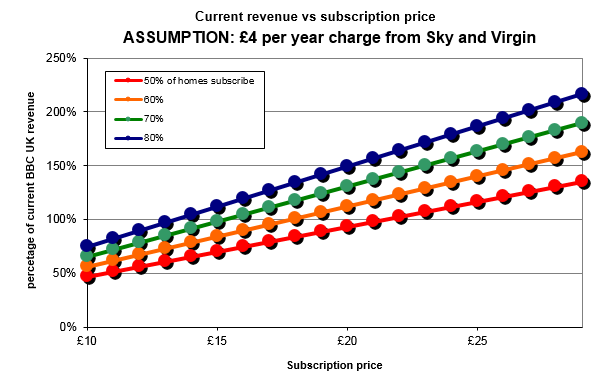 Infact Sky subscriptions have help up very well during the recession. We just do not know if the BBC is overcharging while we have a compulsary licence fee. trevorjharris: " is quite clear that the BBC would not get anything like that if they had a choice of not paying the licence fee"
Can you please provide me with something that supports this assertion? "If Sky were overcharging for their service people would not pay for it. " This is an interesting proposition. Given that Sky Subscriber Services Ltd work in a market with a single participant, it is hard to know, from any reading of competition law history that they could be doing ANYTHING other than overcharging. 3) Using their dominant market position in one market sector (satellite TV subscription) to allow them to enter other markets (say the NOW TV thing). 4) Using "lock in" tactics ("the box is free ... but we disable your Sky+ box's PVR facilities if you stop paying us") to stop customers going elsewhere. This isn't allowed with mobile phones, the network providers have to "unlock" them after you have paid for them. Re "compulsory licence fee" - it's not compulsory to own a television set. Do you complain that "road tax is compulsory" too (but only for people who own a vehicle on the road). How about "council tax is compulsory?" but only if you live somewhere...??? It should remain a criminal offence not to have a TV licence as it is not DIRECTLY the BBC you are defrauding but HM Government. They are allowing you to own and operate 'Broadcast Receiving Equipment' in accordance with the various acts. If they decriminalise that then not paying any government tax should go that way. The money collected is very generously given to the BBC to provide the services we all cherish and would not have any other way or at the same value and standard. I can't believe the MP who suggested this is living on the same planet.